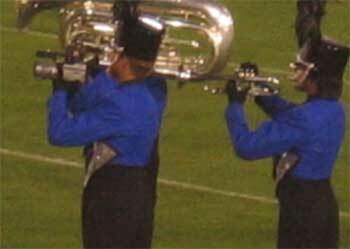 Richard Smith, a 2004 Pacific Crest trumpet player, sent in this one. "I was looking at my photo album from the summer, and I stumbled across this photo I took when I was at Tour of Champions at the Rose Bowl. During the show I noticed one of the trumpet player's horn looked a little odd so I grabbed a picture of it. Look closely at the left trumpet player. Is that a new Dynasty model?"